When you are working with court reporting firms and have ordered a transcript after a deposition, it is obviously important to you and your clients that the testimony is captured completely and accurately. Without a motion or a stipulation among counsel, you only get one shot per witness in discovery, so that transcript better be nothing short of near perfect. However, there are two other significant factors to consider when hiring court reporters: What is the standard delivery time, and what file types are you receiving with your standard order? Now, standard delivery times and file types vary from firm to firm, and this can significantly affect the total cost to you, depending on when you need the transcript and what transcript formats you find most beneficial. 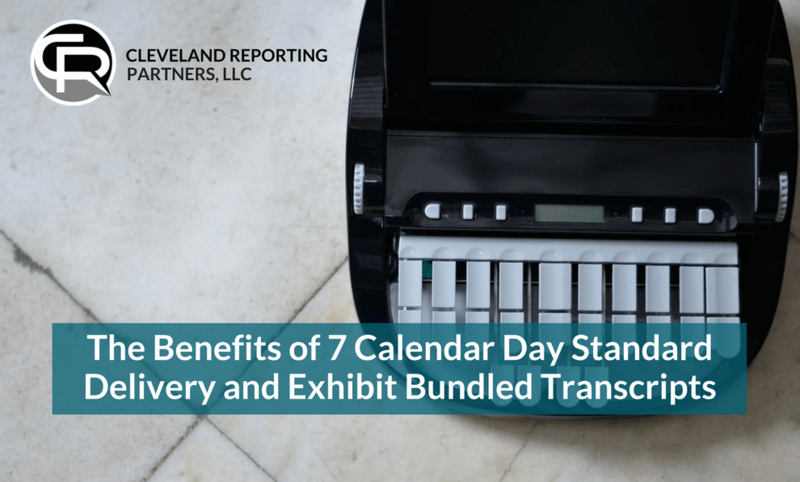 In this article, I will discuss the benefits of the 7 calendar day standard delivery and the Exhibit Bundled PDF Transcript, along with a brief video at the end that highlights the functionality of exhibit bundled transcripts. As a court reporter with 15 years of experience, the most common standard delivery time I have seen in the industry is “8 to 10 days.” But wait; even that is a little misleading, because usually that means business days. So more often than not, if the firm you are working with operates on an 8 to 10 day standard delivery schedule, you are not seeing that transcript for two weeks; and if you need it any sooner than that, you will start to pay expedited rates. However, there are other options out there. Some court reporters and firms actually do operate on a 7 calendar day standard delivery schedule. I personally have been working within this structure for the past 12 years, and there are several obvious benefits. When discovery moves into the deposition phase, depos are often scheduled in bunches and quite frequently close in time to one another. Knowing that you will have your transcripts within one week of taking your depositions without starting to pay expedited rates is a great benefit to you and your clients. This short turnaround allows you to review transcripts before the next depos in the case, which is particularly helpful when you reach the expert deposition phase of discovery. Finding dates where all counsel in a case are available to attend depositions can be tricky enough. Having to wait around for transcripts should not delay or complicate the deposition scheduling process even further. 7 calendar days means exactly that. If you take a deposition on a Monday, you have your transcript the next Monday; take the depo on Tuesday, you have your transcript the next Tuesday…and so on. When working with reporters who work on a 7 calendar day standard delivery schedule, there’s no need to open up a calendar and count business days around weekends and holidays to figure out exactly when you will be receiving your transcripts, making scheduling for everybody much simpler and more organized. This is also beneficial for the reporter, as he or she always knows exactly when their transcripts are due. As stated earlier, depositions are often scheduled in bunches, and review of previous transcripts prior to subsequent depositions is extremely helpful and may cause you to alter your deposition outline. If you are working with reporters and firms operating on an 8 to 10 business day delivery schedule, you will be paying an expedited page rate if you want your transcripts for review prior to depositions scheduled the next week. These extra costs can be avoided by working with reporters who operate on the more efficient 7 calendar day delivery schedule, allowing you to be more prepared for your next depositions without expedited charges. Discovery in complex litigation doesn’t have to be unnecessarily drawn out due to litigation support. If you are taking many video depositions in a complex case and ordering transcript synced videos, court reporting firms that operate on the 7 calendar day delivery schedule for transcripts will most likely apply this schedule to all the litigation support services they offer, including delivery of digital or hard copy videos and transcript synced videos. So if you’re looking for a more streamlined and organized discovery process, inquire about standard delivery times and seek out litigation support who operate on a more efficient standard delivery schedule. Along with standard delivery times, another important factor in choosing your litigation support is what file types you will be receiving with your standard transcript order, and what (if any) formats you may be paying extra for. Being a big fan of organization and efficiency personally, my favorite transcript file type to produce is the exhibit bundled PDF (or PTZ if you prefer e-transcripts). The bundled transcript allows you to have your deposition exhibits and the transcript all in one super file with hyperlinks to pull up exhibits every time they are mentioned in the body of the transcript. Not only does this make your transcript review process more efficient, but it cuts down on downloads and subsequent cataloging within your case management system. If you are using a case management software that supports PTZ files, the software will automatically separate out the exhibits from the transcripts and place them in the appropriate folders within that system. There are many choices for litigation support in the City of Cleveland, all over the State of Ohio, and nationwide. When it comes to court reporting, reputable firms will most always produce extremely complete and accurate transcripts. However, the levels of efficiency and emphasis on organization will vary greatly from firm to firm. Working with litigation support who value efficiency, expediency, functionality of their products, and organization will in turn make your entire discovery process more streamlined and manageable in all your cases. Cleveland Reporting Partners has always worked on a 7 calendar day regular delivery schedule and offers a wide variety of transcript formats (including exhibit bundled PDFs) as standard with any transcript order. Visit our court reporting and legal video pages to learn more. Todd L. Persson has been serving the Cleveland legal community as a court reporter since 2002 and is a Co-Founder of Cleveland-based litigation support firm Cleveland Reporting Partners, LLC. He has spoken on the future of court reporting and technology on the Stenographers World Radio national podcast, has had blogs featured nationally by the National Court Reporters Association and the American Translators Association, and has contributed articles to the Cleveland Metropolitan Bar Journal. To read Todd’s full bio, visit our Partners page. Connect with him on LinkedIn here.